Old Oak Tree Lives on! A number of years ago an old oak tree on our boundary fence had to be felled for safety reasons. This tree had stood on the boundary since before the Nursey was first established. As our national tree it also held a special place in our hearts, and a large section of the trunk had been left at the back of the Nursery waiting for an idea of how to use it! 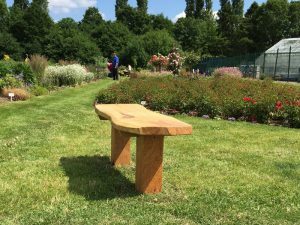 Eureka we have it – we need some benches for our celebration garden so visitors can sit a while and enjoy the garden. We asked William Lee, a local skilled chain saw carver living in Hemel Hempstead, to help and he came and collected the trunk ( http://chainsaw-carvings.co.uk/ ) The project was slightly delayed when a robin decided to nest on the saw, so we had to wait while the chicks fledged. Will sawed the trunk and was able to make four benches. 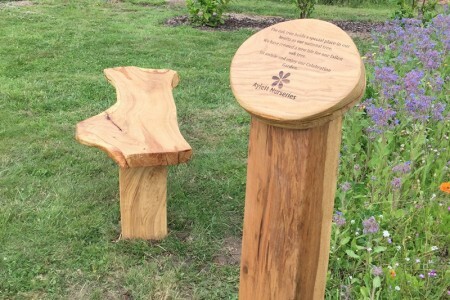 These are now in situ in the Celebration Garden, where they will be a permanent feature for visitors to use. We hope you can take the time to enjoy the garden which is now a blaze of colour and stop a while to smell the roses!